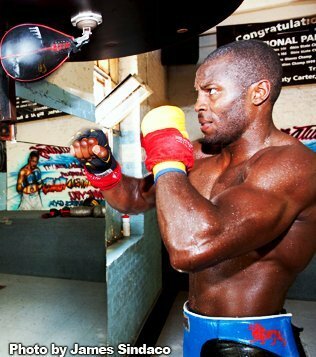 Following service in the US Navy, where the moniker, ‘USS’ comes from, and a successful amateur career, in which he won the 178lb National Golden Gloves, Steve Cunningham embarked on a professional career in 2000. Cunningham headed into the Krzysztof Wlodarczyk IBF Cruiserweight title bout on a 19 fight win streak. Wkodarczyk recieved a disputed split decision. In the rematch, Cunningham settled the score, winning the IBF Cruiserweight title. Later that year Cunningham stopped Marco Huck in Germany. Currently, Cunningham competes in the Heavyweight division. Although Cunningham lost his last outing to British Heavyweight hope Tyson Fury, a bout in which Cunningham dropped the much larger Fury in the second round, Peter Fury was impressed enough to invite Cunningham into the Fury camp, to spar Tyson in preparation for David Haye. This week Boxingroundup caught up with Steve Cunningham, to find out how camp has gone. BR: Firstly, how has camp gone Steve? SC: Camp has gone very good. I learned some new things, made new friends, and pushed Tyson hard in preparation for David Haye. BR: Peter selected you for this camp obviously because you share some qualities as David Haye, movement, speed and power. You penetrated Tyson’s defence in your bout, has his defence been tightened up? Or do you feel Tyson is under appreciated technically? SC: Tyson can be a very good technical boxer. But he gets mixed up in a fight, and roughs you up pretty good. He does have a good defence. BR: Hughie Fury now a pro prospect, is a main sparring partner of Tyson. Did you spar with him this camp? SC: Yes. Hughie is in good hands with Peter Fury. Peter works those guys right. Hughie is smart, young, still learning and works hard, that is a great combination. I look for him to do some good things in the sport. BR: Journalists and fans view the American Heavyweight scene at a low period in the last ten years. Yet yourself being selected for the Tyson Fury camp, and Deontay Wilder being drafted into the David Haye camp. Do you see the American Heavyweight scene picking up in the near future? SC: It is starting to pick up. You have guys like Jennings, Wilder, and a few more guys, that will make noise in the future. BR: Wladimir Klitschko is in the middle of camp, in preparation for his title defence against Povetkin next month. Another American Heavyweight, Johnathon Banks, heads up that camp as trainer. Do you plan on joining that camp before returning to the states? SC: Yes i am here now. I am on a European sparring tour! Wladimir and i share the same lawyer. They reached out and i said why not. Two camps back to back is how i done it, before i was champion. That is the key to staying sharp. So here i am. BR: Where to next for Steve Cunningham? Any opponents or dates lined up? SC: My next step is to get back in there and get a win under my belt. No opponent confirmed. But we are looking at possibly November 16th. BR: You reached the pinnacle of the sport as the IBF Cruiserweight World Champion. What goals do you still aim to achieve? SC: My goal before i retire is to be the Heavyweight Champion of the world. Thank you for your time Steve, much appreciate.